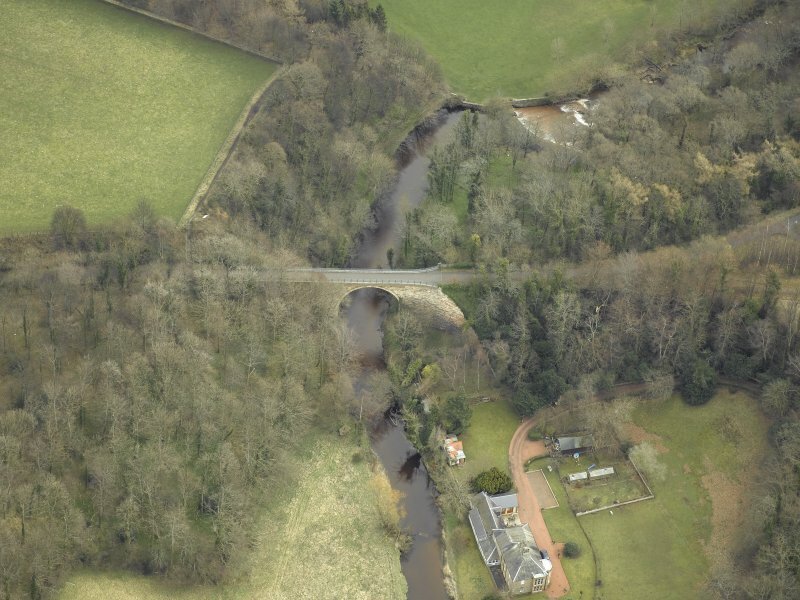 Oblique aerial view centred on Glenesk railway bridge, taken from the W.
Detail of commemmorative sign explaining renovation. 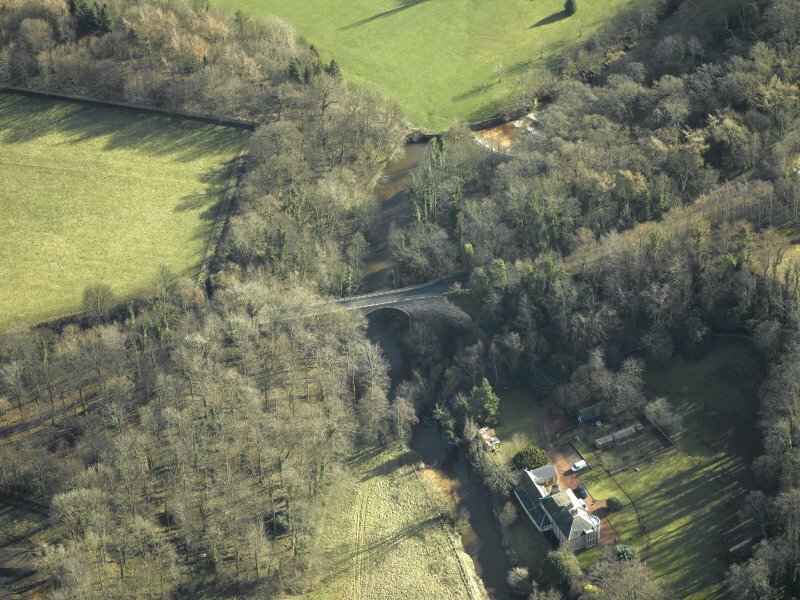 Oblique aerial view centred on Glenesk railway bridge and the site of Glenesk Junction with Elginhaugh Bridge in background, taken from the SE. E face of bridge, oblique view from SE. View from N showing modern deck and parapet fence. 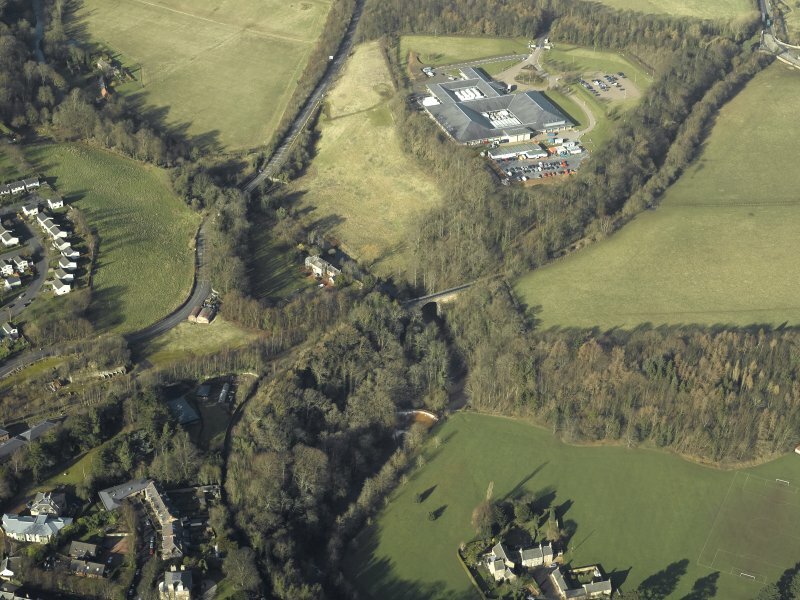 Oblique aerial view centred on the railway viaduct with the house and summer house adjacent, taken from the W.
Oblique aerial view centred on Glenesk railway bridge, taken from the SW. Formerly entered as Railway Bridge at cited location NT 32376 67136. 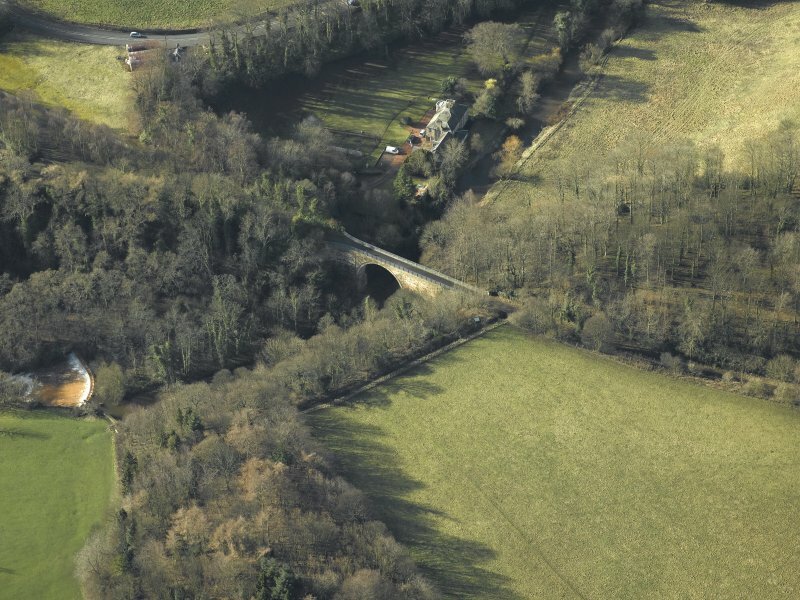 Not to be confused with Newbattle Viaduct (NT 32595 64844), for which see NT36SW 67. For corresponding road bridge (adjacent to W), see NT36NW 73. 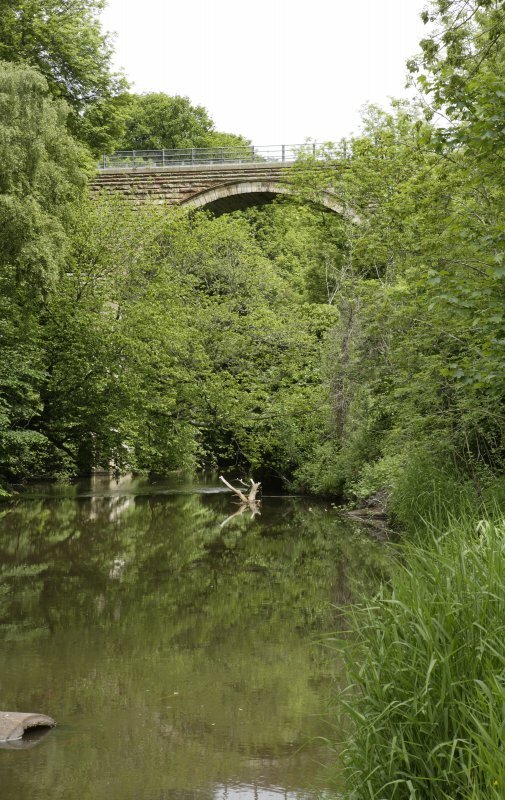 This 60 foot high viaduct was constructed to take the railway over the River North Esk. (Location cited as NT 324 672). 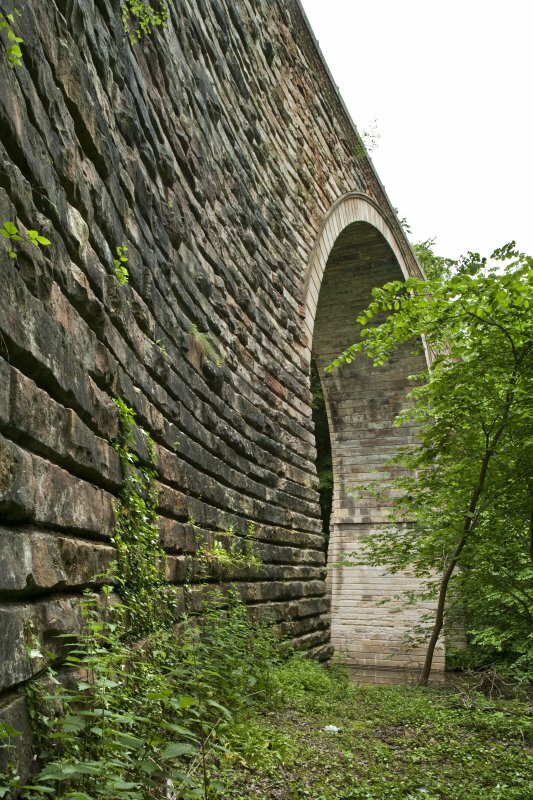 Railway bridge, opened 1849 by the Edinburgh and Hawick Rly. A large single semicircular masonry arch, with substantial steel reinforcement. 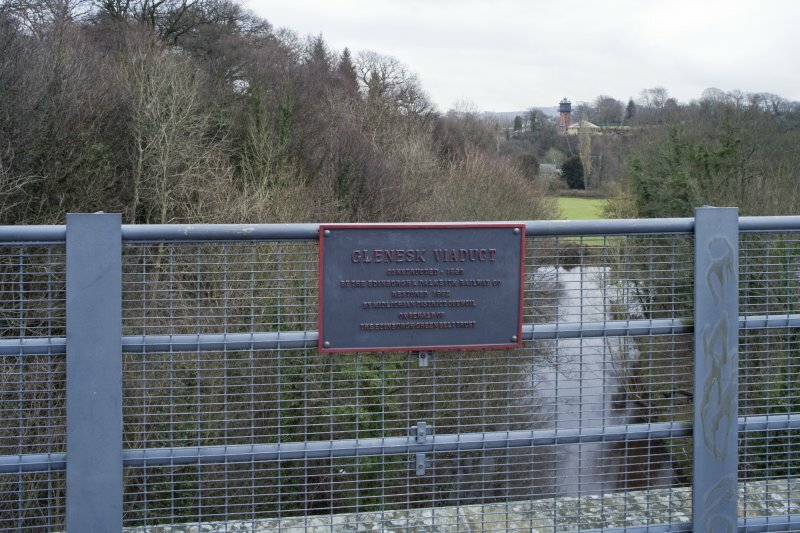 It has been claimed that the Glenesk Bridge was constructed in 1847, the engineer being John Miller (1805-1883), and even that the present structure replaced an earlier timber bridge. A construction date of 1847 has also been included on the recently made plate attached to the bridge. However, recent research by the author wishes to demonstrate that the current stone structure beneath deck level is nearly two decades older and that no earlier timber bridge existed at this location. The elegant, late-Georgian style of this bridge, which incorporates fine ashlar masonry, extensive curved wing-walls, tapering pilasters and archivolts, gives rise to the conclusion that it was designed by a close associate of Telford, James Jardine (1776-1858), who was the enginner to the Edinburgh and Dalkeith Railway. 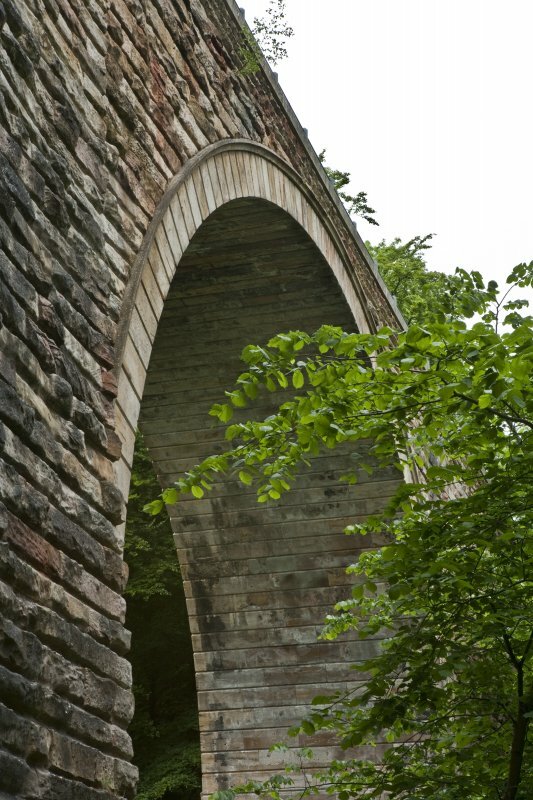 Its erection between 1829 and 1831 seems beyond doubt and its elevation, which is in marked contrast to the general run of mid-19th century standardised railway arch bridges and viaducts, is similar to some of the road bridges which Telford created in the Highlands. Consequently, in terms of historical engineering, it should be considered of national importance as the finest pre-Victorian railway bridge in Scotland. Contemporary evidence is totally lacking for an 1847 date and an earlier timber structure, but circumstantial evidence makes a convincing case for an 1829-31 date of construction, while acknowledging that no specifications or contracts have yet been discovered. The first piece of evidence is the stylistic one mentioned above, the second relates to the original width of the design. This width corresponded to the requirements of a single track, 4ft. 6in. gauge, railway on the grounds of cutting back on capital cost. Having rejected proposals for a timber or iron bridge, Jardine opted for the stability and greater logevity offered by a masonry structure. Although the track was double from Edinburgh to the N side of the bridge, it became single at that point and remained so as far S as its South Esk terminus at Dalhousie Mill. The manager of the Railway Company, David Rankine, stated in August 1838 that the clear width between each parapet of the bridge was 14ft. 10in. 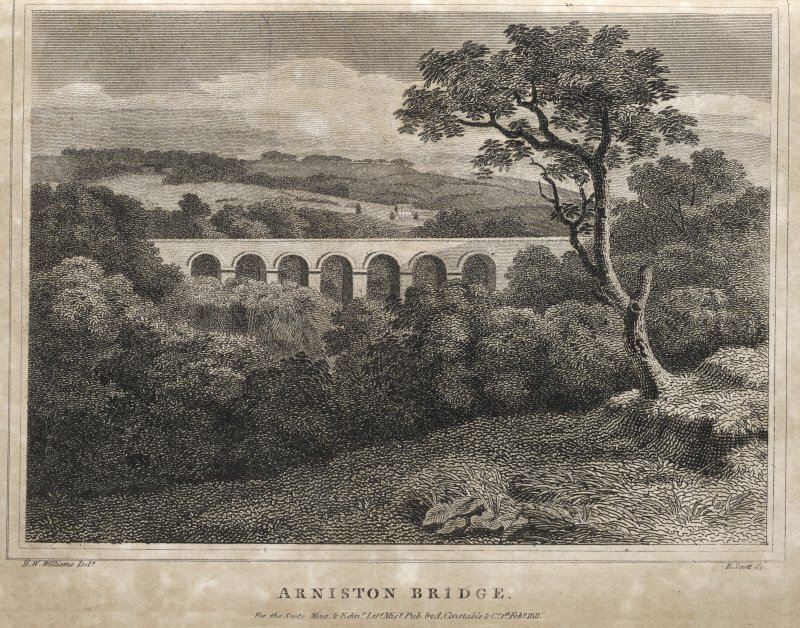 Acknowledging that the bridge was built of stone and assuming that Jardine would follow his normal practice of constructing masonry paprapets to a thickness of 12in. with 14 in. capping stones, the resultant overall width of 17ft. concurs with the recent measurement of Blyth and Blyth. Lack of contemporary evidence and the fact that Rankine had actively considered double tracks on either side of the bridge with three rails crossing it, a design which would have found the central, common rail over the weakest part of the structure, militate against the notion of an original timber bridge. Additionally, there would not have been any major work undertaken at that time, as the Dalkeith Branch line was about to be opened. A compilation on railways, published c.1840 and written by Francis Whishaw, affirms that , according to Rankine, the main line was double throughout its length. It would seem therefore that either the 3-rail arrangement alluded to earlier had been implemented or the deck of the bridge had been widened by this date. As the guage was increased to 4ft. 81/2 in. in 1847, Jardine or the later Miller must have overseen the widening of the deck by 50% or more, accomplished by cantilevering out footways at both sides so that the main structure was strong enough to bear twin track loading. 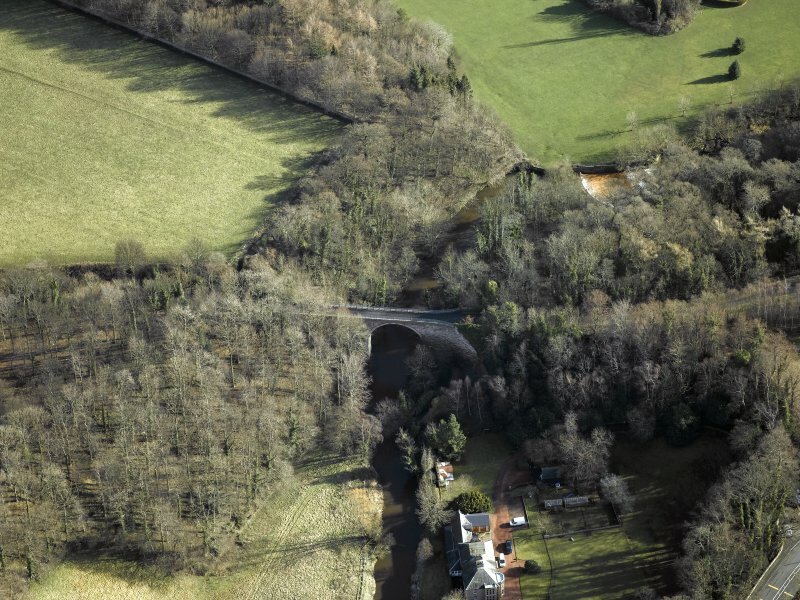 Final compelling evidence for an 1829-31 dating stems from both the design variation and the width difference between Glenesk Bridge and the Dalhousie or Lothian Viaduct which was built under the direction of Miller one and a half miles further south. Not being built ro a double track width, its overall width of 17ft. at the crown of the arches is noticeably less than that of Dalhousie Viaduct, which is 28ft. Glenesk Viaduct, 1847, John Miller. Dramatically sited in relation to the [A7] road, spanning both it and the [River] North Esk, constructed for the North British Rly to carry the Waverley route from Edinburgh to Hawick. 23 segmental arches on brick voussoirs, whose ashlar piers have been braced with old rails. 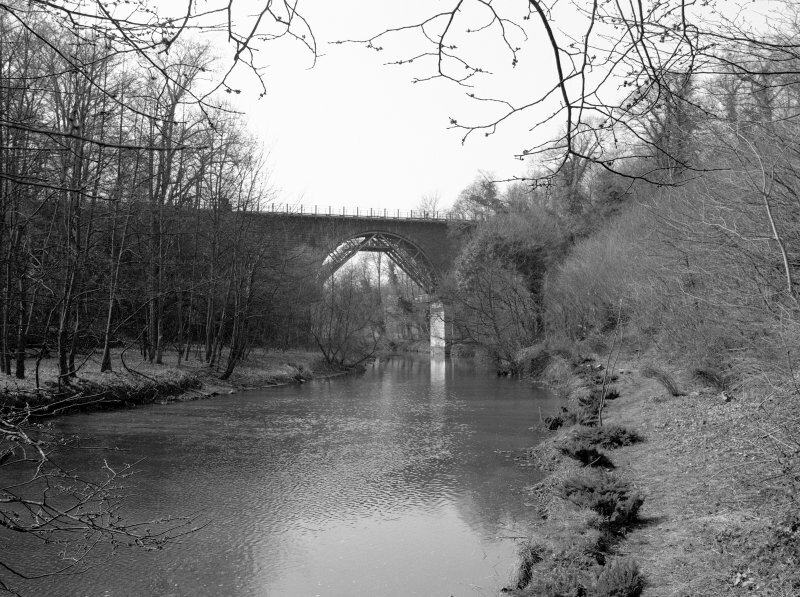 Strengthened with steel to counteract mining subsidence; Thomas Beeching proved a stronger threat and the viaduct was closed in 1969. Repaired in 1993. This bridge/viaduct is clearly shown taking the railway over the River North Esk on the 1st edition of the OS 6-inch map (Edinburghshire 1854, sheet 7) and on the 2nd edition of the OS 6-inch map (Edinburghshire 1895, sheet viiiNW). It is shown carrying the dismantled railway/cycle track over the river on the current edition of the OS 1:10000 map (1978) and on the OS Basic Scale raster map (ND). Information from RCAHMS (MD) 26 July 2001. 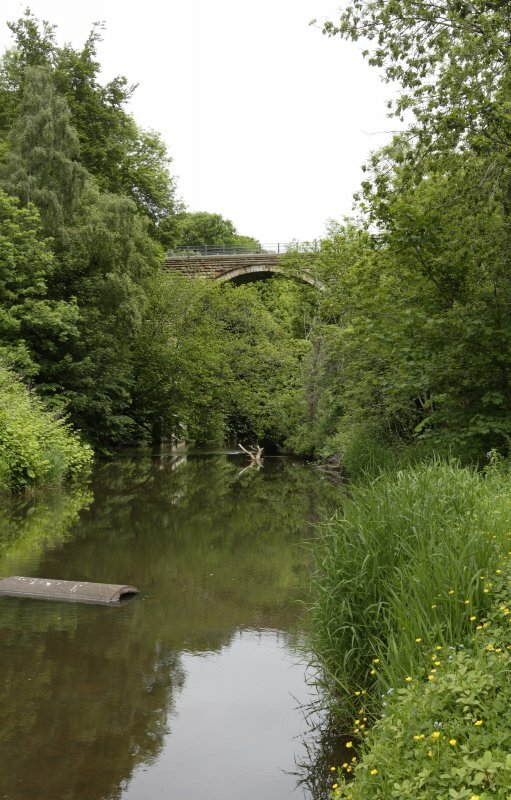 The bridge also lies in Lasswade parish. This record apparently incorporates two successive structures. 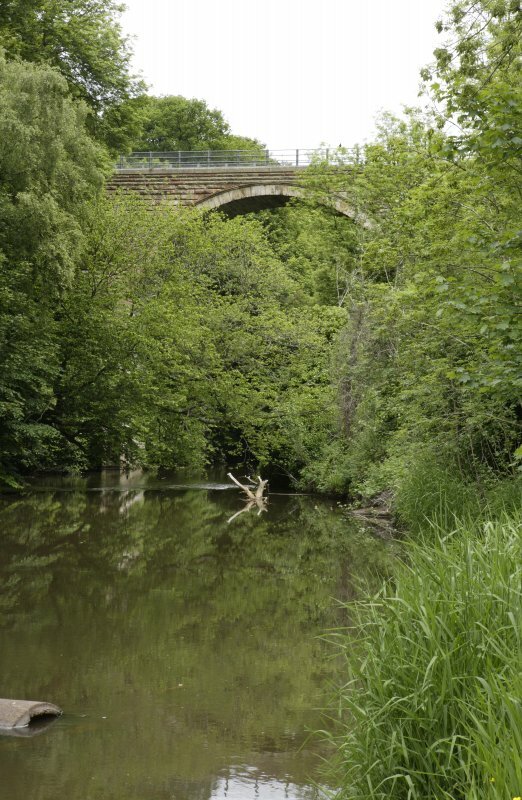 The first bridge or viaduct formerly carried the Edinburgh and Dalkeith Rly over the River North Esk to the N of Eskbank (NT36NW 229) and NW of Dalkeith (NT36NW 141). 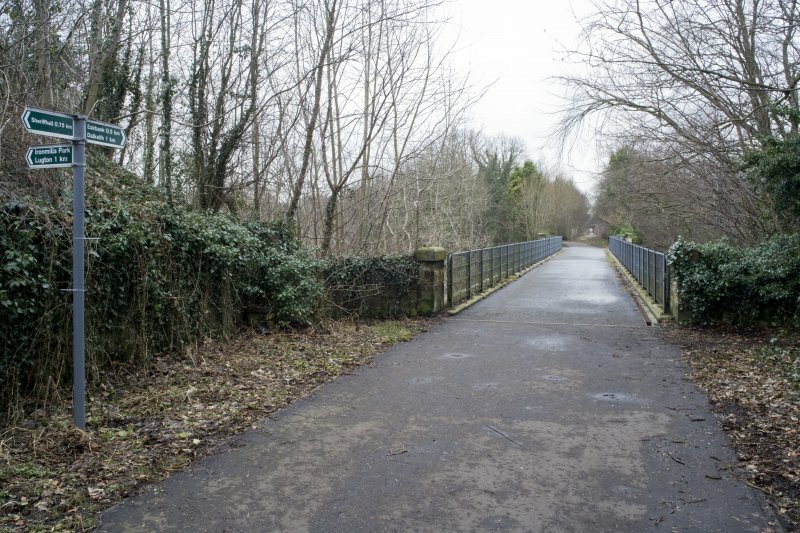 The line of this railway was incorporated into the Edinburgh-Carlisle 'Waverley Route' of the (former) North British Rly, presumably necessitating construction of the present bridge. The entire line closed to regular passenger traffic on 6 January 1969. The viaduct currently forms part of a cycle track, but apparently forms part of the portion of the route for which reopening is projected. Per contra the note above, the entire structure falls within the parish of Dalkeith. It is depicted, but not noted. on the 1978 edition of the OS 1:10,000 map and the current OS (GIS) AIB. The location assigned to this record defines the centre of the span over the river (to the S of the midpoint of the structure. The available map evidence indicates that it extends from NT c. 32372 67124 to NT c. 32373 67176. Upgrading of 1830s bridge in 1840s. Cantilevered walkways added, since removed (1993). Conserved. Now in pedestrian/cycle use. 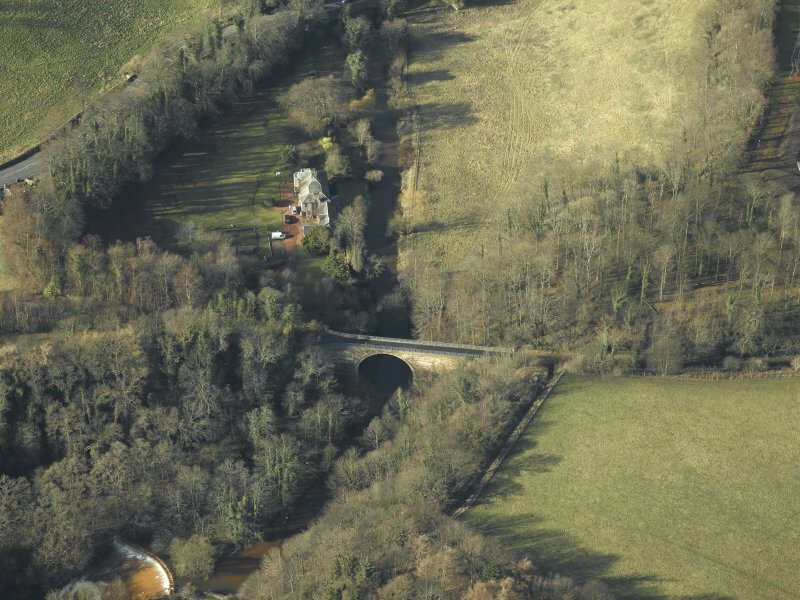 Glenesk Bridge, Dalkeith consists of a single-span semicircular ashlar masonry arch over the North Esk with a span of 65 ft and an original width of 15 ft between parapets. It was designed by James Jardine and attractively embellished with archivolts, tapering pilasters and extensive curved wing walls with an elevation reminiscent of a superior bridge of the Highland Roads era.The bridge was tastefully conserved in 1993 for pedestrian and cycle use by the Edinburgh Green Belt Trust with a grant from the Railway Heritage Trust. Unsightly steel trussing to protect the arch against the effects of future coal mining was removed together with cantilevered footways probably added by Miller as part of the North British Railway upgrading in 1847. NT 32372 67136 Glenesk Railway Bridge This bridge spans the River North Esk and the A7 trunkroad at Dalkeith. The bridge is reputed by some authorities (eg Hume 1976) to have been opened in 1849, having been constructed on behalf of the North British Railway Company in 1847 by the engineer John Millar (1805–1883) to replace an earlier timber bridge (Paxton 1993). Paxton (1993) claims that the stone structure below deck level is nearly two decades earlier and that no earlier timber bridge existed at this location. The elegant, late-Georgian styling of the bridge, which incorporates fine ashlar masonry, suggests to Paxton (1993) that it was designed by the engineer James Jardine (1776–1858), a close associate of Telford, and erected sometime between 1829–1831. If this is so, in terms of historical engineering, it should be considered the finest pre-Victorian railway bridge in Scotland (ibid). 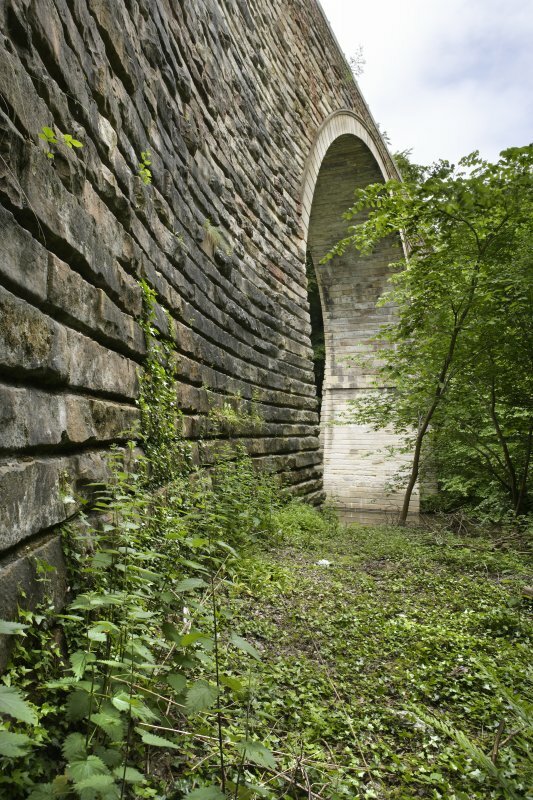 The viaduct has a single segmented arch with 64 voussoirs. It has extensive curved wing-walls, tapering pilasters and archivolts.